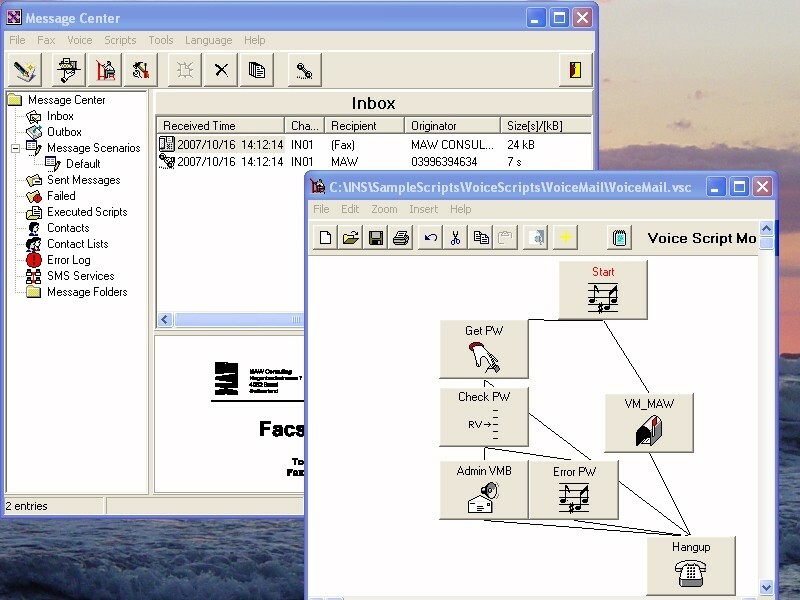 Integrated Notification System (IVR Software) – MAW Software Ltd.
INS is a highly configurable IVR (Interactive voice response) software, designed to send messages through your computer and let your computer handle incoming calls. INS works with professional voice boards, through VoIP, or as well as with low cost, voice-enabled modems. Design Interactive voice response (IVR) scripts to answer incoming calls. The caller can navigate through the interactive voice response (IVR) scripts by pressing digits on the phone keypad ( IE “Please press 1 for a description of our products, 2 for fax-back and 3 to speak to an operator”). Interactive voice response (IVR) scripts like multi-user voice mail boxes, credit card verification or Fax-on-demand are set up within minutes. The system supports an unlimited number of incoming lines. Scanning external application for values and in the event the criteria is met, send a message to a user. Ideal for SCADA alarming or Network monitoring. By using the intuitive but powerful graphical workflow Designer you can create interactive phone applications (Also called Interactive voice response (IVR) Systems), where the caller uses the phone keypad to enter values and navigates through a script. Applications like Credit Card verifications, Fax-on-demand or Voice Mail may be designed within minutes. All values entered by the caller are available for further processing in the script or can be exchanged with any other application like Excel or MsAccess. INS can handle an unlimited number of incoming calls. By using the intuitive but powerful graphical workflow Designer you can create scripts that react on incoming messages. The message (SMS or E-mail) is queried for the specified values and format and then you can react on its contents. SMS/E-mail forwarding, SMS/E-mail auto reply, SMS on demand, etc, may be designed within minutes. All values received are available for further processing in the script or can be exchanged with any other application like Excel or MsAccess. When sending a message you can decide to send it using a pre-specified communication channel or to let INS choose the most appropriate channel. If you let INS choose the channel, it will automatically adapt the message to suite the selected communication link. The messages can be sent through the Message Center interface or using the command line interface of SendMessage. Check-It allows you to query other applications for values and send alarm messages if those values exceed the defined limits. This feature makes the suite invaluable for SCADA applications, where you need to monitor factory floor data. Network administrator may set up events to monitor the loss of communication and sent alarm messages to the support group. INS integrates perfectly into SCADA applications like CitectSCADA (CiTechnologies), InTouch (Wonderware), RealFlex (RealFlex Technologies) or RSView (Rockwell Software). To get data for its interactive scripts, INS accesses the variables of those packages through ActiveX or DDE. The SCADA packages in turn can send alarm messages through the SendMessage utility or the Check-It event scanner. INS supports all major voice boards, voice modems and VoIP by using the Microsoft TAPI standard to communicate to the devices.